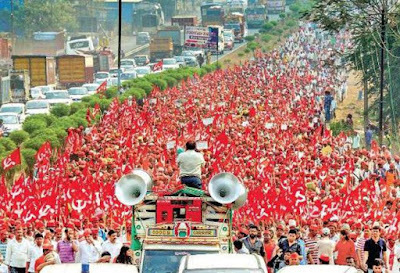 The Polit Bureau congratulated the kisans of Maharashtra for the success that they achieved in their struggle for the implementation of the Forest Rights Act, remunerative prices and pension; loan waiver for the indebted farmers etc. The Long March of the kisans under the leadership of the All India Kisan Sabha that began from Nasik on March 6 and culminated in Mumbai on March 12 was a huge success. While the march began with around 25,000, by the time it reached Mumbai six days later its ranks had swelled to 50,000 plus. 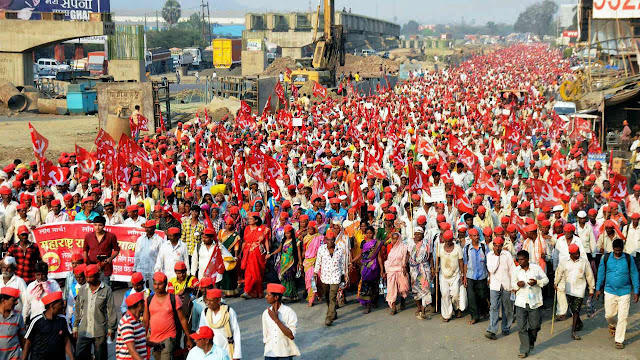 The march forced a written assurance from the Government of Maharashtra accepting the demands of the farmers. This has had a nation-wide impact. It is now incumbent upon the Maharashtra government to honour its promises in a time bound manner. The Polit Bureau hailed the support received by the long march from all sections of people of Maharashtra and the wide spectrum of political and social movements. The Polit Bureau heard a preliminary report on the results of the just concluded elections to the Tripura Legislative Assembly. These results were unexpected especially since the Left Front government during its tenure has tried its best to implement pro-people programmes and strengthen the atmosphere of peace and amity. However, given the limited resources at its command it was not possible for the Left Front to meet the growing expectations among the people. The IPFT campaigned in these elections that their victory will lead to the formation of a separate tribal state of Twipraland. The BJP-IPFT combine was able to skillfully use this with their call for a change of government. This apart, the BJP deployed money on a huge scale and also utilized other resources to influence the elections. Finally, it was the ability of the BJP to consolidate all the anti-Left votes and virtually appropriating the votes polled earlier by the Congress Party that led to the Left Front’s setback in these elections. However, the Left Front polled 45 per cent of the votes, while the BJP-IPFT alliance polled 50.5 per cent. The Polit Bureau strongly condemned the post-poll violence indulged in by the BJP in the state. Over 750 offices of the Party have been attacked, many of them burnt and gutted. There have been physical attacks on 742 party workers and supporters, more than 1829 houses have been attacked and looted and 217 houses have been set on fire. 442 shops owned by Party members and supporters have been burnt; 35 rubber plantations attacked and extortion of money has been done from 230 people. The Polit Bureau heard reports of the solidarity actions that have taken place in various parts of the country. The Polit Bureau called upon the entire Party units and ranks to rise in solidarity with our comrades in Tripura who are facing such attacks by the RSS/BJP in the state. 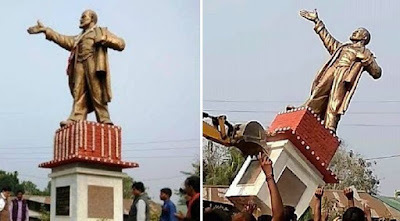 Fascists vandalize Lenin's statue in Belonia town, Tripura state. The comprehensive defeat of the BJP in the bye-elections to the Lok Sabha from Uttar Pradesh and Bihar is a positive development. The Left parties had declared support to the SP candidates in Gorakhpur and Phulpur in UP and the RJD candidate from Araria in Bihar. The PB greeted the electorate for rejecting the BJP. The CPI(M) had also extended its support to the CPI(ML) candidate from Jehananabad assembly constituency. The CPI(M) extends its full support to the no confidence motion moved by the YSR Congress and the TDP in the Lok Sabha demanding the implementation of the assurance given by the government on the issue of special status to the state of Andhra Pradesh. The government’s betrayal on this promise is unacceptable. This government’s all round failure and evasion of parliamentary accountability will be highlighted in the debate on the motion. Even while more than the required ten per cent of the Lok Sabha Members stood in favour of this motion being accepted, the Presiding officer adjourned the Lok Sabha on the plea that the house was not in order. The same Lok Sabha passed the Finance Bill permitting the government to withdraw sums of money to the tune of nearly ten lakh crore of rupees from the Consolidated Fund of India in the din without a discussion while there was no order in the house. The BJP’s double standards in the conduct of the business in parliament and its anti-democratic character is condemnable. This BJP government continues to pursue its policy of attacking the institutions of higher education particularly the central universities. Such attacks on higher education is part of the overall philosophy of this government that seeks to replace the study of Indian history with the study of Hindu mythology and the study of Indian philosophy as a study of Hindu theology. The pro-RSS Vice Chancellor of Jawaharlal Nehru University has been undemocratically attacking democratic rights of the students (like imposing compulsory attendance for post graduate and research students) and imposing severe restrictions on their activities. Some deans and heads of the departments have also been removed by the university administration. While the RSS student wing, the ABVP, spearheaded the attacks against the Jawaharlal Nehru students movement, progressive members of the teaching community are sought to be replaced by those who propagate the Hindutva ideology. The UGC has issued a new notification, reportedly in adherence to a judicial direction to make changes in the reservation rosters for various posts for appointment. This will affect the Delhi University directly as it slows down the reservation category appointments and a stoppage of the ongoing appointment process. The government had accepted to file a review petition on this judicial direction but this has not been done yet. This direction of the UGC must be put in abeyance so that the filling up of reserved criteria posts at the University level in Delhi is not delayed. The Polit Bureau discussed the draft political-organisational report to be presented to the 22nd Party Congress to be held at Hyderabad from April 18 to 22, 2018. This will now be put before the Central Committee at its forthcoming meeting from March 28 to 30, 2018 and after its adoption will be placed before the Congress.